The Boss B1560 task chair without arms offers classic design features with a stylish finish to complement the decor in any commercial office or home environment. Measuring 26.5" W X 27" D X 40.5-44" H, this understated chair is perfectly sized for use in any space while still providing a comfortable seat for extended use. 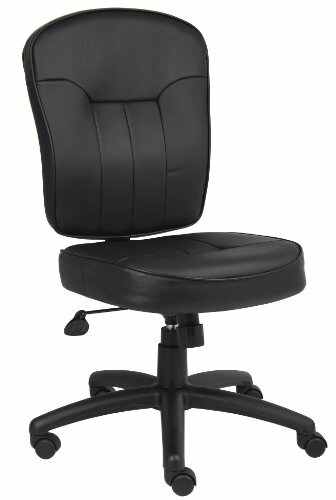 It has extra-large seat and back cushions, and soft, yet durable, black polyurethane-infused Leather Plus upholstery. The versatile design includes an adjustable tilt tension control with an upright locking position, and a pneumatic gas lift adjustment for controlling the seat height. The 27" nylon base provides stability, while the hooded double wheel casters make it easy to move around the office. Some assembly required.